6 Week Food Makeover Challenge | Momma on Fire! You may have heard this before or seen this meme on Pinterest. It’s absolutely true. You can workout all you want but if you aren’t eating right, you’re not going to lose the fat. Exercise gives us shape, diet is what takes the fat off. And that doesn’t mean go on a diet either. Diets have expiration dates and what do we all do after they end? Welp, we go back to eating like we were. Because didn’t you miss cake and fries? Real sustainable weight loss requires a lifestyle change. 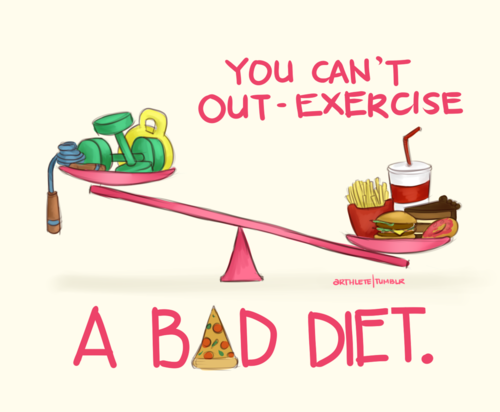 And that doesn’t mean you have to give up cake or french fries or any of that good stuff. It just means you have to learn how to eat well overall. So starting July 16th, that is exactly what we are going to do. I am forming a challenge group that will be held on Facebook in a private group. I will provide you with support, direction, mini challenges, motivation and love. Your responsibility will be to show up, to check in and to take charge of your eating. All changes that I will ask you to make will be realistic. This might be emotional and it might be hard, but we don’t get to experience change without getting uncomfortable and let’s face it… are you really comfortable with your body right now? If you are, that’s great! I’m so happy for you! But if you aren’t… then it’s time to move out of that comfort zone. You have to truly be committed to this. I want people who seriously want to get track on food and seriously want to change their bodies. We are holding each other up here so I don’t want anyone who is going to flake – that hurts the support system that we need to form to stay on track. So seriously think about this. For this entire 6 weeks, you must check in everyday AT LEAST once a day, more often is preferable. This is your support and your motivation. The more you reach out, the more we can have each other’s backs. The more we support each other, the more we keep each other on track. I am requiring Shakeology on this one. Now I know, it’s expensive but I want you to think about something before you say you can’t afford it. Is that really true? Is there something else you are spending money on you probably don’t need to be that you could put that money toward something that is so incredibly good for your body? If it’s your morning Starbucks, knock it off. I can show you how to make a Shakeology Frappuccino. Having ShakeO in the mix makes this SO EASY! That’s your breakfast right there! BAM! One less meal to have to think about. I absolutely recommend ordering HD (monthly autoship) Shakeology BECAUSE a. you get free shipping so you save some money. b. You’re going to be on this challenge for more than one month so you are saving shipping 2 months in a row and c. WE WILL BE DOING A SHAKEOLOGY CLEANSE IN THE MIDDLE OF THIS CHALLENGE so this ensures that you have enough. Also – you can cancel the HD any time with an email to customerservice@teambeachbody.com no questions asked. It does not matter what flavor you get, but I would recommend getting the bag over the packets – you get more servings. You can get Shakeology from my site: beachbodycoach.com/turborachel or my ShakeO site: myshakeology.com/turborachel OR from the Team Beachbody store. Shakeology seriously changed my whole world. It is responsible along with Turbo Fire for much of my weight loss and if you don’t believe me, well, check out Team Beachbody because I was the March Team Beachbody Challenge Shakeology winner. What up! I must be your Team Beachbody coach to be in on this challenge! If you do not have a Team Beachbody account, you can sign up through my site at beachbodycoach.com/turborachel and click join. A free membership will suffice. If you do have an account, you can set me as your coach by emailing coachrelations@teambeachbody.com and asking them to set your coach as TurboRachel, coach ID 128848. There is absolutely no negative self-talk or putting each other down allowed in this group. We are here together to nurture and lift each other up. This is about support and part of that means supporting yourself. Supporting yourself is about learning how to talk to yourself in a positive way. Changing our eating habits goes along with changing how we treat ourselves – our whole selves. There are a lot of dimensions to food and a lot of what we use food for is often emotional. Learning how to treat ourselves kindly helps eliminate our need to emotionally eat. So if you want to join me on this, please email me at turborachelfitness@gmail.com with the subject reading “July Food Challenge” and I will tell you how to join. I am limiting the amount of challengers to 10 and it is first come, first serve but PLEASE, I ask again: MAKE SURE YOU ARE WILLING TO COMMIT 100%. This is serious business and we all make ourselves vulnerable by entering into a challenge like this. Your being there is a link in the chain of support. So let’s help each other be strong, stay on track and do this.